I’ve dabbled in art all my life, pretty much. In elementary school I was taught by Chiyo Araki, who had also taught my mother when she was in school, and whose books, Origami in the Classroom I & Origami in the Classroom II (which she was writing when I was in first grade) are still on the shelves at our local Uwajimaya. In 7th grade I had an art teacher, Pamela Gossett, who really got me going on graphite pencil artwork. For the next few years I turned out reams of drawings, most of horses, and many of them on lined notebook paper. I didn’t really understand why that bothered my mom; my focus was the drawing; who cared about the lines? This seems strange, in light of my tendency to be obsessively perfectionistic about what I draw, and I have no explanation to offer, even after all these years. I took an oil painting class with my mom during my early teens, and produced 3 paintings. I still have one of them, a big-horned sheep, and my mom has another of an Arizona sunset. The third, a baby raccoon climbing a tree, is in Japan somewhere, given as a gift to a visiting friend of our family. It didn’t occur to me to take a photo of it, so all I have is a dim memory of what it looked like. My high school art teacher, Frank, who drove a beat-up old station wagon with band-aids painted over its dents and dings, tried unsuccessfully to get me to “loosen up.” My meticulously realistic renderings didn’t please him; art, to Frank, wasn’t about drawing what you saw, it was about drawing your interpretation of what you saw. I didn’t want to interpret. I was fascinated with shapes and shadows, and with the process of creating them in a two-dimensional form that your eye would perceive as three-dimensional. I thrilled to the challenge of making them appear so real that the eye couldn’t distinguish them from reality. I guess I’m just as contrary as my dad, who continues writing poetry that rhymes, in spite of having been told by numerous editors that it will prevent his ever being published. After high school my drawings dwindled and then stopped. College, married life, and motherhood took the place of art. In 1984 I made a New Year’s resolution to create at least one new drawing each month. 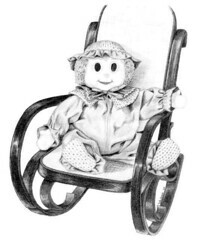 This resulted in a single piece, a still-life of my kids’ stuffed clown doll sitting in their child-sized bentwood rocker, which my daughter Risa clearly remembers watching me draw. Since I was pregnant with Risa at the time, I’m not sure how she managed this, but then again, what do we really know of what unborn babies perceive? A few years ago I happened upon a display of colored pencil artwork by Anne deMille Flood, and was amazed at the depth and richness of color she had achieved. I went to several of her seminars, dragging my friend Torben along so I would have someone to talk to. Anne introduced us to Ann Kullberg, known for her portraits of children, and that started a new succession of seminars. Colored pencil has replaced graphite as my medium of choice. It has all the appeal of working in graphite, with the added challenge of finding the perfect color blend. I’ve learned that what you see and what you think you see can really be very different. Frank would probably be appalled, since purposefully stripping away misperceptions probably moves me even further into the realm of realism, but that’s okay. I’m much too slow and methodical to ever consider becoming a professional artist, anyway! Congratulations on the Honorable Mention of “Sister Love” . Such a talented person you are. Just lovely.